Many might remember the well-known spiritual song, Dem Bones, we learned as children to understand how the skeleton is connected. Just to refresh the memory, the song lyrics, “toe bone connected to the foot bone, foot bone connected to the heel bone, heel bone connected to the ankle bone,” and so on, make the skeletal connection throughout the entire body. Similarly, while we might think that body parts operate independently, all cells communicate with other cells using chemical signals that are transported through the blood stream and nervous system via fluids, neurotransmitters and hormones. Complex cell signaling elicits an action or a response that very often begins with the immune system, appropriately located in the gut. Would it surprise you to learn that an unhealthy gut is directly connected to many autoimmune diseases that can occur throughout the body and affect muscles, joints, eyes, nerves, skin, glands, blood vessels and all bodily organs? Functional medicine physicians who seek to find the root causes of disease, as opposed to simply suppressing symptoms with medications, point to Leaky Gut Syndrome (LGS) as the major cause of disease and dysfunction, accounting for at least half of chronic complaints. We hear a lot about heart disease, cancer and diabetes, but not all that much about the 80 plus disorders that can result when the body’s immune system attacks its own tissues and organs. Per the National Institutes of Health (NIH), autoimmune diseases have increased dramatically worldwide since the 1940’s, with as many as 23.5 million Americans affected. In contrast, cancer affects approximately 13 million Americans. The NIH draws a relationship between the alarming increase in autoimmune diseases and the increased production and use of chemicals in agriculture and environmental pollutants, including chemical toxins, bacteria, viruses and molds. Further, genetic predisposition, infections, and gut dysbiosis all play major roles in the development of autoimmune diseases, which progress slowly over time. The NIH also notes that the alarming rise of autoimmune diseases parallels the dramatic changes in our food supply over the last 50 years. We no longer consume food shortly after hunting or harvesting; we use more genetically modified crops than all other countries combined; we spray our vegetables and fruits with pesticides, fungicides and insecticides; we inject animals with antibiotics and hormones and feed them an unnatural diet; we use chemicals and artificial preservatives, flavorings and colorings; we use artificial sweeteners and consume alarming amounts of sugar and sodium. Add in industrial pollutants, exposure to toxins in plastics, cleaning supplies, cosmetics, and personal care products, along with the widespread use of antibiotics, pharmaceuticals and OTC medications, and you begin to get some idea of what our immune systems, elimination organs and digestive systems are up against. 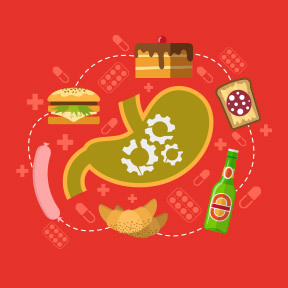 The gut has a surface area of about 200 square meters, which comes in contact not only with foods but with everything else we ingest. And though we carry beneficial intestinal microorganisms, that outnumber our cells 10 – 1, the microbiome is substantially affected by diet, toxic substances and medications. Microbial changes in the GI tract have a profound effect on inflammatory and metabolic responses. Dysbiosis and digestive issues resulting from an imbalance in the digestive tract are often early signs of autoimmunity. As all foods are either inflammatory or anti-inflammatory, certain dietary choices can modify the ecology of the microbiome, often resulting in a susceptibility to inflammation-driven autoimmune diseases. The intestinal lining, the first line of defense for the immune system, is only one cell thick with tight junctions between cells. With LGS, intestinal hyperpermeability allows undigested food particles, bacteria, and toxins, that would normally be eliminated, to enter the bloodstream. When this happens, the immune system activates and begins to make antibodies against its own tissues, laying the groundwork for diseases that include alopecia, rheumatoid arthritis, fibromyalgia, Crohn’s, multiple sclerosis and many others. Make dietary changes to eliminate added sugars, starches, grains and common allergens like dairy, peanuts and gluten to curb inflammation and reduce yeast overgrowth. This allows this intestinal tract to slowly heal and return to its normal permeability. Leaky gut leads to malabsorption of nutrients, which in turn leads to deficiencies, particularly in vitamins D and B12, iron and zinc. Supplementing with these nutrients, a high-quality multivitamin and omega-3 fish oil helps improve the condition of the mucosal lining and reduce inflammation. Anti-inflammatory L-glutamine, an essential amino acid, is critical to the growth and repair of the intestinal lining. Support your microbiome with probiotics to keep harmful organisms in check and aid nutrient absorption. Quality probiotics nourish and support a healthy gut and reduce symptoms of dysbiosis. Digestive enzymes help to break down food particles before they reach the intestines, preventing larger undigested molecules from irritating the intestinal lining. Digestive enzymes may also help to reduce inflammation in the gut to give added support to the immune system. Dysbi-Ease by Biospec Nutritionals – This highly effective supplement provides all natural antibacterial and antifungal ingredients that help dispose of harmful microbes and yeasts that can lead to dysbiosis. Use this product in conjunction with a probiotic taken 3 hours apart. Immune Support by Theramedix – This professional strength proprietary enzyme blend breaks down undigested proteins to boost and support immune health. Delayed release vegetarian capsule. Rehmannia Complex by Professional Complementary Health Formulas – This liquid botanical formulation assists the body in inflammatory conditions associated with autoimmune disorders. Neuro-Immune Infection Control™ by Neurobiologix – This broad spectrum professional formula combines natural ingredients shown to effectively inhibit yeast and bacterial overgrowth to help control inflammation to allow the body to heal. Wheat, soy and milk free formulation. Zinc Drink™ by Metagenics® — This convenient liquid zinc formula supports healthy immune function and assists enzyme activity associated with numerous biochemical reactions. Gluten, soy, and dairy free, vegetarian formulation. D3 Plus® by Bio-Tech – This excellent source of natural highly absorbable vitamin D3 is combined with vitamins K1 and K2, magnesium and zinc in support of optimal immune, cardiovascular, and neuromuscular health. Gluten, yeast, and dairy free. L-Glutamine 1,000 mg by Pure Encapsulations – L-glutamine nutritionally supports the integrity of the mucosal lining and healthy functioning on the gastrointestinal tract, aiding nutrient utilization and absorption, and limiting passage of toxins through the intestinal barrier. Gluten and soy fee, Non-GMO vegetarian formulation. This entry was posted in Home and tagged D3 Plus® by Bio-Tech, Dysbi-Ease by Biospec Nutritionals, Immune Support by Theramedix, Neuro-Immune Infection Control™ by Neurobiologix, Rehmannia Complex by Professional Complementary Health Formulas, The Leaky Gut Connection to Autoimmune Diseases, Zinc Drink™ by Metagenics. Bookmark the permalink.